Big Lots has had a big 2013. The closeout merchandise retailer's stock is up more than 20% so far this year, trouncing the market's 8% rise. And the latest bump came after the company reported fourth-quarter earnings that were better than expected. Mixed profitability: Big Lots beat analysts' expectations for $1.99 per share in earnings on the quarter. Instead, the company managed to book $2.09 in profits, which was a 19% jump over last year's tally. Comparable sales fell by 3.5% in the U.S., but a bigger store base helped push total revenue up by 4.4%. 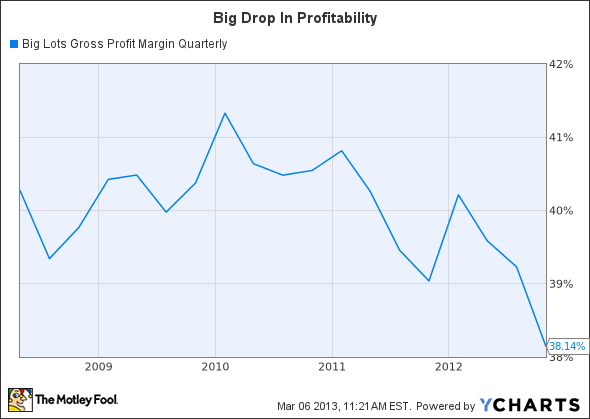 Still, gross margin dove to 39.6% of sales, which was the lowest quarterly figure the company has reported in years. For the first time since acquiring its Canadian business in 2011, that unit wasn't a drag on Big Lots' earnings. Canadian operations actually kicked in $0.2 million in net income for the quarter. Sure, that's not enough to even add $0.01 to the company's per-share profits. But it was much better than the $0.08 loss from last year's results. Just don't plan on that division powering more profits in the near-term, though. Big Lots expects Canada to lose money again in 2013, on the order of between $0.05 and $0.10 a share. Investors were probably the most relieved to see the company's updated outlook. Big Lots expects adjusted earnings this year to come in at about $3.15 a share, or 5% better than the $2.99 comparable figure from 2012. Sales are expected to rise by 2% to 3%, or just a bit slower than this year. If Big Lots can deliver steady sales growth like that, the company should keep earning its way off the discount rack. Valuing shares at less than 14 times trailing earnings -- even after the big run-up -- the market has been too pessimistic about Big Lot's future. The company may have profitability concerns to deal with, but its growth looks set to continue. The article Why Big Lots Shares Bounced originally appeared on Fool.com. Fool contributor Demitrios Kalogeropoulos has no position in any stocks mentioned. The Motley Fool owns shares of Big Lots. Try any of our Foolish newsletter services free for 30 days. We Fools may not all hold the same opinions, but we all believe that considering a diverse range of insights makes us better investors. The Motley Fool has a disclosure policy.